Moved ILS fail flag location on PFD to the end of the NPS. Deletion of engine download limits no longer cause the nuisance red oil temperature and pressure vertical scales. Nuisance CDS MAINT or DSPLY SOURCE messages causing DEU removals addressed. DUDB maintains compatibility with NW Phase 3A DUs. The CWS Roll and Pitch annunciation boxes will now blink for 10 seconds when CWS mode engages to improve pilot awareness. The CDS logic for the NPS has been improved to not interfere with the display of the lateral ILS dev scale when manoeuvring to align with the localizer. Fuel Imbalance Alert can now be displayed when the airplane is on the ground (helps for refuelling!). Revised CDS logic to avoid sending data to the FDR that contains a false indication that a distance to runway threshold is displayed on the PFD when no distance is actually displayed. Updated the CDS fault logic to avoid uncommanded WXR turn-on that can occur when the DEU is on and the EFIS CP is detected off. In-flight Start Envelope updated (FL270 to FL240) for CFM56-7BE SAC engines. Enhanced DSPLY SOURCE dispatch indications on the PFD to DSPLY SOURCE 1 (2). Added a DU Overheat fault message to the CDS BITE. Weather Radar test mode fault message colour changed from cyan to amber. “MAN SPD” displayed in small white letters will be displayed below and to the right of the airspeed tape when speed reference set to the SET knob position. Fixed Incompatibility between DEU-I and FMC U12. Revised the On-Ground logic for the Airspeed Filter. 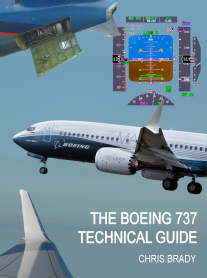 To ensure that a PSEU fault does not inadvertently indicate an erroneous in-air state to the PFD airspeed filter and affect airspeed filtering during takeoff roll. Updated CDS to implement stroked ND indications to enhance the existing RAAS feature consisting of additional visual data that includes SHORT RUNWAY and ON TAXIWAY annunciations. 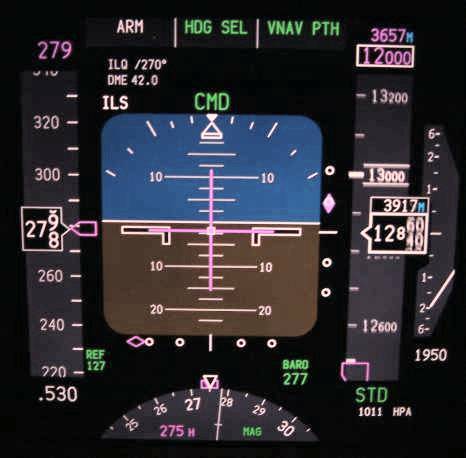 Optional RSAT: Overrun Warnings; Speedbrake Warnings; Perspective Runway on Heads-up Display. Optional RCAS: Autopilot Roll Saturation Alerts; Roll/Yaw Symmetry; Roll Authority; Enhanced Bank Angle Warning.